I am back in Chicago once again, after a much needed vacation. After two weeks of sun, scuba diving, rock climbing, whitewater rafting, jungle trekking, and beer drinking (I believe Salva Vida is my new favorite beer), it's back to reality. Paying bills, getting ready for school and work to start, loads of laundry and spring cleaning...this is how I spent my weekend. Kind of a post-vacation buzz kill right? Luckily, there are a few things this spring that I have to look forward to, weddings to attend and new babies to meet, and of course, the big bike ride. Every summer for the past four years, my sister and I have participated in the MS 150 bike ride in northern Minnesota. Our mama was diagnosed with Multiple Sclerosis back in 2007 (she still isn't convinced, she's stubborn like that :-), and with the help of great doctors and almost daily yoga, she is doing great and thoroughly enjoying her retirement. We will continue to do this ride, and raise money for the cause, because even if it turns out in the long run that our mom doesn't have MS, other people's moms still do, and that's more than worth riding for. The ride is less than two months away, and that means after a lazy winter, it's time to get back on my bike. I have learned my lesson about exercising for four hours and not replenishing my calories, or not eating enough before the ride. It's not a pretty sight when you are a mile away from your apartment, but your legs just stop working, and you simply can't fathom riding another yard. Not pretty at all. I am much more proactive now, making myself a fairly big, protein-rich meal before I leave, and packing lots of high calorie snacks with me when I go on those 40-to-50 mile rides. It makes for a much happier and healthier biker. This meal was chocked full of protein, healthy fats, and filling calories. Plus, it was all stuff I had in my pantry, save for the avocado, but I usually have one or two of those lying around anyway. Simple ingredients, with big flavors and textures, this meal is a snap to throw together before a big ride, but tastes decadent enough for a great meal anytime. If you would like to donate to the Multiple Sclerosis Society you can visit my personal page here, and read more about the disease and why I ride. In a bowl, mix together the quinoa and edamame, and toss with one teaspoon of olive oil and season to taste with salt and pepper. Heat a tablespoon or so of olive oil in a non-stick pan over medium-high heat. 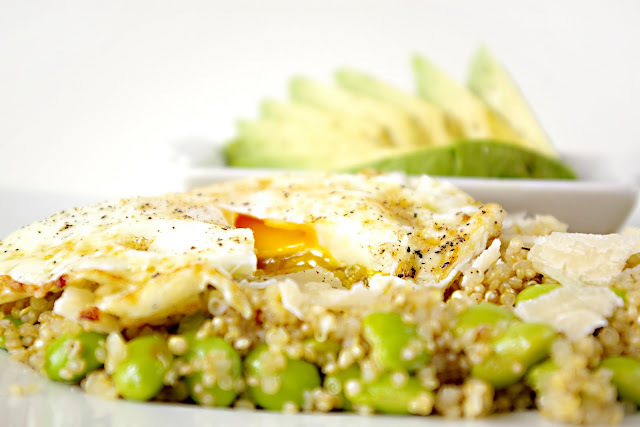 Fry the egg until whites are set, but yolk is still runny (this will make a nice little sauce for your quinoa). Season egg with salt and pepper. 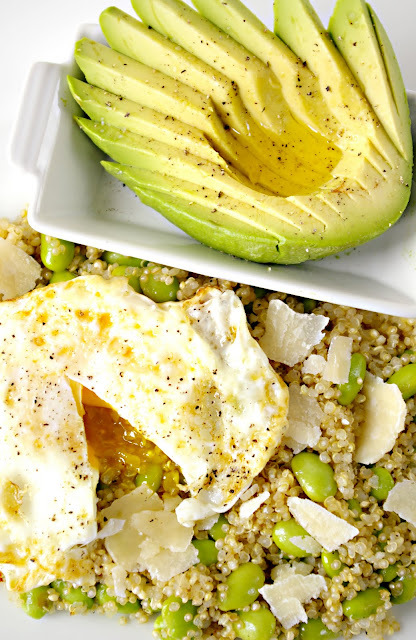 Sprinkle the cheese over the quinoa and top with the hot fried egg. 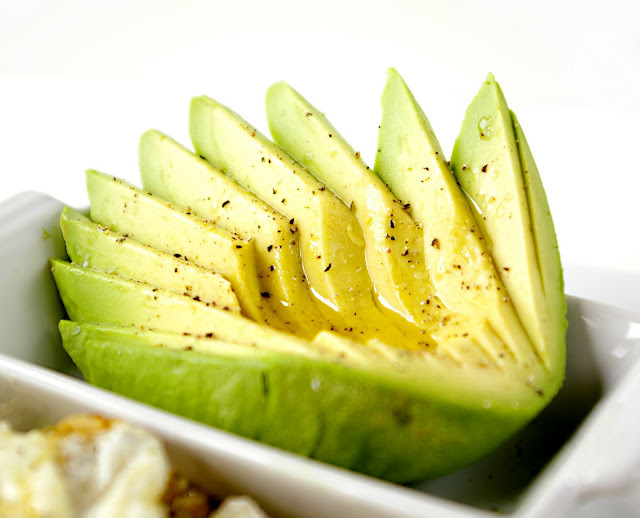 Serve with the sliced avocado, drizzled with a bit of olive oil and seasoned with salt and pepper. Yum! Looks so delish yet so simple. oh, how beautiful! this is right up my alley. I am in complete shock this beautiful recipe exists. Your pictures are immaculate. I'm totally moved by your comments about your mom and her quest to find her diagnosis. I love that she does yoga. I would love to think yoga cures everything, no? I think the reason this recipe struck me is because I not only love quinoa, I too, just made a quinoa/egg/avocado recipe, but yet to edit and post. Yours blew me away! How yummy?!! And...I know, weird enough, mine had edamame, too. I wasn't a huge fan of it in this dish, but it really stuck with me and now that I see your beautiful pics, post, and recipe...just great! Thanks so much for sharing about your journey and carry on, fried egg, quinoa, avocado, edamame eater! This looks great. I found my way here by googling quinoa with fried eggs. And I thought you should know someone is using your photo & recipe without giving credit where credit is due. 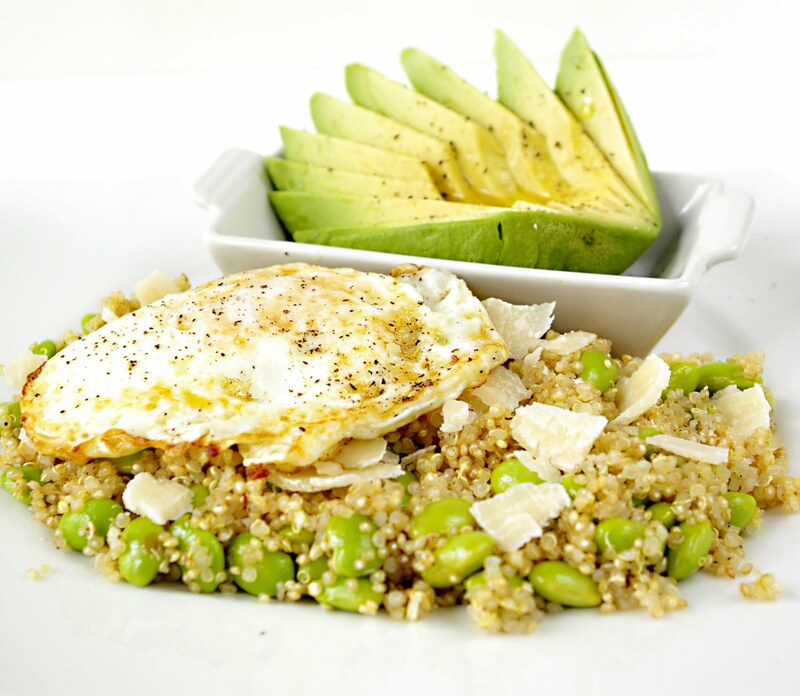 ( http://hadleyavenue.com/2013/06/22/quinoa-with-edamame-parmesan-egg/ ) if someone was taking credit for my stuff I would want to know, especially if they came up in Google first. I can't wait to try this out tomorrow. Yvearl, thank you for the kind words, sorry for the late response, I have been neglecting the blog lately!! I was just contemplating what to make for Meatless Monday tonight! I have everything for this in my cabinets/fridge! Thank you for posting this! Your pictures are beautiful!